I have lost count of the number of times that I started to learn to play the piano. My mom had an old black upright piano that moved with us from state to state and sounded beautiful to me whenever she played – but the years and the moves weren’t kind to the poor instrument. It was a relic of her childhood, carried over into mine. At some point during my college years she treated herself to a new piano that now lives at my brother’s house. Mom was more than happy to teach us to play when we took an interest. But she wasn’t going to come banging after us to practice, or in any way harangue us for this or any other endeavor. She loved to play, but had her moments during those learning years when she had to be pressed to continue by her mother. She had a picture of herself as a concert pianist, unrealized because she didn’t put in the necessary hours of practice and single minded dedication. 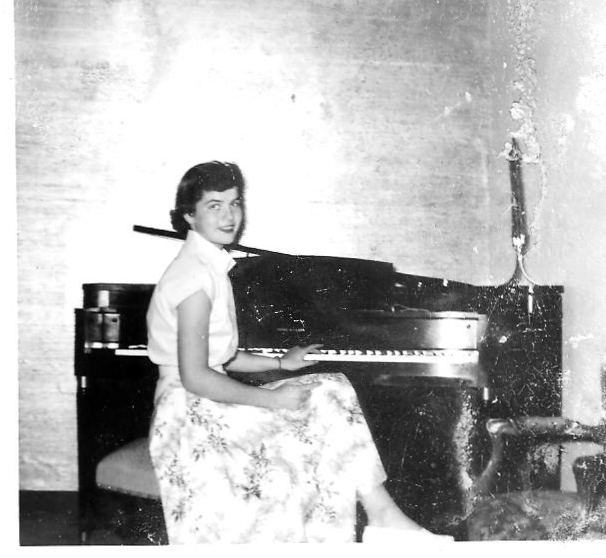 Mom at a piano, not the one I mention – and long before she was ‘mom’. My nieces’ dance recital has brought this and other creative efforts to mind, as it does every year. I am enchanted by the growth of their skill, poise and grace each year. I don’t have to be there for the moments when they just don’t have it in them to go to a particular class. When they have to make a choice between practice and another activity. I just now realized that I haven’t ever asked my sister how much effort she puts into banging after them to work through a momentary dip in interest and effort. I know that she puts a lot of her own time and effort into making their ability to dance a reality. I took dance classes too, here and there – now and then. We didn’t ever have the facility and the talented people that my nieces have had the pleasure to be exposed, that perhaps they don’t recognize as a gift. The other gift that they may not recognize is the time and expense that my sister puts into their pursuit. There are so many options, so many interesting pursuits that we could take on – intellectual, creative, etc. A whole lot of factors have to convene just so to create excellence – dedication and a support system being just the start. Regardless of dedication, sometimes the difference just comes down to having someone to come banging after you when your energy and dedication flag a bit.